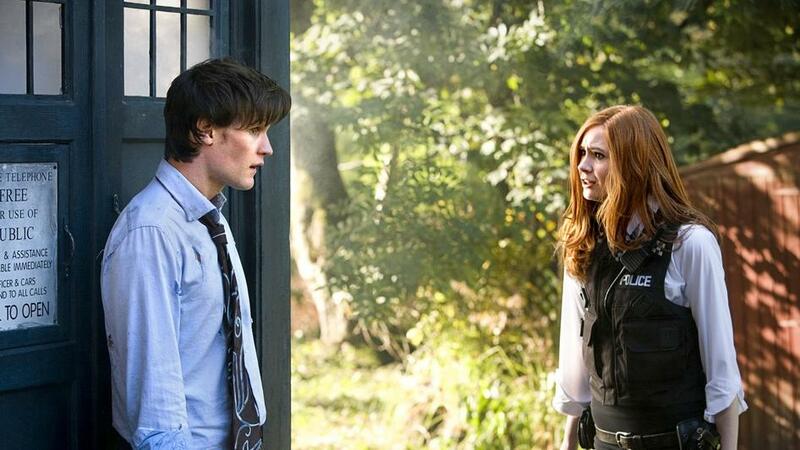 It’s been a long time, but the new season of Doctor Who came to BBCAmerica last week. The show opens right where the last episode left off, with the TARDIS crashing and the new Doctor holding on for dear life while everything burns, before going to new opening credits complete with a new logo. I’m probably going to spoil some things here, but not everything. The Doctor finally crashes seemingly in response to young Amelia Pond’s prayers to Santa help with a crack in her wall. After the two meet, we get a great scene with a regeneration crisis revolving entirely around the taste of food in a new mouth that begins with apples and is finally satisfied only by fish sticks and custard. After determining the crack is in fact a crack in space and time and closing it, we learn that something called “Prisoner Zero” has escaped through it to Earth. Before he can investigate further, the Doctor is forced to run back to the TARDIS after sensing a greater emergency. He tells Amelia he’ll be back in five minutes, and even though you know what’s going to happen, it’s still heartbreaking when she packs her suitcase and waits for the Doctor to return and the five minutes becomes 12 years. Upon returning to find the adult Amy, we learn that Prisoner Zero is a creepy shape shifter that’s been deceptively hiding in Amy’s house all this time. Also during the twelve year gap, Amy has been through 4 psychiatrists trying to cope with meeting her “imaginary friend.” As the adventure continues, we see that everyone in Amy’s life (her aunt, her cousin Jeff, her “boyfriend” Roy) recognizes The Doctor from Amy’s cartoons and can’t believe that he’s real. One of the greatest aspects of this episode is that even though all of the Doctor’s usual gadgets like the TARDIS, psychic paper, and the sonic screwdriver are present, they were taken off the table giving The Doctor only has 20 minutes to save the world from the Atraxi who have come to Earth to recapture Prisoner Zero. There are also some great twists like the references to “the human residence” and the way Prisoner Zero takes advantage of the years it’s had to bond to Amy. The dialogue is brilliant throughout, but I particularly enjoyed the Doctor’s credentials when convincing the world leadership to listen to him: “the real proof to Fermat’s theorem,” “why electrons have mass,” and “faster than light travel with two diagrams and a joke;” and the ominous words Prisoner Zero leaves the Doctor with: “The universe is cracked. The pandorica will open. Silence will fall.” The threats made to the Atraxi were also great, and the video reel of the Doctor’s history on Earth sent chills down my spine. I love this show. All in all, this was a great first episode for all involved setting up the new players and threats. I am always a concerned that I’m not going to like the new Doctor whenever he regenerates, but each time that goes away pretty quickly. Matt Smith is fine and may even turn out to be great. This was certainly a good start. I already love Amy Pond. 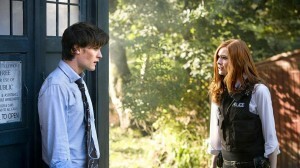 It’s interesting that the Doctor is traveling with an other redhead whose wedding he’s delaying. I also remember noticing the music and liking it quite a bit. The commercial breaks on BBCAmerica featured inside looks on the new season of the show with interviews of Executive Producer Steven Moffat and the cast (thanks, BMW). This show is in great hands and we even get a glimpse of how things might come together as the season plays out when Amy asks why The Doctor why he wants her to come with him. The Doctor passes it off as loneliness but we see a prominent crack on a screen inside the TARDIS and the music gets ominous. I’ll save my wild speculations for another post though. The next episode of Doctor Who airs tonight at 9PM on BBCAmerica.